Home > Sailing > What Are 'Bridge Hoppers'? Bridge hoppers are the bane of the British waterway network, but who are they and why do they provoke such animosity? Officially there are two ways you can live on a boat on Britain’s network of waterways. 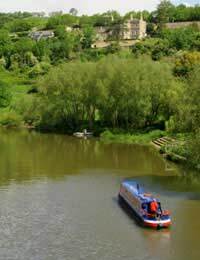 Firstly, you can find yourself a permanent residential mooring, and use this as a base from which to go exploring. The downside of this is that mooring fees can be expensive. Alternatively, if you were attracted to the waters by the idea of roaming up down and around the 2,200 miles of rivers and canals, never staying in one place, then you could forgo the permanent mooring and opt to be a ‘continuous cruiser’. Although this relieves you from the financial burden of residential mooring fees, the appeal of having to keep moving on soon wears off. But isn’t there a more agreeable medium of the two - couldn’t you have the stability of location of one and the cheapness of the other just by switching between local public moorings? In a word, no. This is cheating the system. By doing so you become what is derisively known as a ‘bridge hopper’. Nevertheless, disdain from other boaters and disapproval from the waterway authorities has not stopped many boaters adopting this unlawful liveaboard lifestyle. The bridge hopper – or continuous or constant moorer – doesn’t want the travellers’ lifestyle of the continuous cruiser but the stability of a permanent resident. Because of work, schools and friends, they want to stay in the same location, but can’t get, or are reluctant to pay for, a residential mooring. So instead they exploit the freedoms of the continuous cruiser status. What is the Continuous Cruiser Status? This is not to say that ‘continuous cruiser’ is simply a euphemism for a boater that can do whatever they please. Officially there are strict guidelines that such a waterway user must follow. A continuous cruisers is defined by British Waterways as a boat that makes a “genuine progressive journey around the network”, never staying in one location for more than 14 days. This means it must maintain reasonable journey distances between each successive mooring, moving further and further away from the starting point. For the true continuous cruiser these restrictions do not present much of a problem, unless the weather is particularly adverse, you fall ill, boat breaks down or the canals are ‘stopped’, and exceptions are granted for such instances. Unfortunately, actually enforcing these guidelines has proven to be difficult for the waterway authorities. This has allowed bridge hoppers to masquerade as cruisers, sullying their reputation in the process. Many now see the two groups as one and the same, and dismiss both as freeloaders that contribute little to the upkeep of the network. The level of status already accorded continuous cruisers on the waterways is not helped by being relative newcomers to the waterways. Prior to 1995, all boats on the canal system required a permanent home base for their vessel. Those boaters who lived on the move still existed but they had to declare a permanent mooring. With some justification they complained that such a system unfairly penalised them because it meant they had to pay a marina owner for services they didn’t take advantage of, and therefore subsidise the boaters who actually lived there. Their complaints led to British Waterways introducing an exception for continuous cruisers in 1995. Many bridge hoppers have claimed in their defence that they have not adopted this lifestyle through choice but necessity. With the liveaboard population steadily rising, suitable residential moorings are becoming harder and harder to secure. However, it is argued that boaters who find themselves in such a situation have not followed one of the basic rules of liveaboard – always secure an appropriate mooring before buying a boat. If a mooring is not available in the area that you wish to live then you should either look somewhere else or abandon the idea of living on a boat altogether. In the bricks and mortar housing market, it would be unheard of for those property seekers unable to find a reasonably priced residence in their desired location to simply set up camp on the town square instead. Damaging EconomiesBesides the resentment they inspire in other water users by cheating the system, there is an argument that the actions of bridge hoppers damage waterside economies. With temporary moorings at a premium, there are concerns that bridge hoppers prevent visitor boats from mooring, and so keep them from spending money in local shops, restaurants, and bars. There have been proposals to deal with the problem of bridge hoppers. For instance, British Waterways has put forward the concept of the ‘roving mooring permit’. Interesting, but I find it hard to understand the anger towards 'bridge hoppers'. I use my boat according to the continuous cruiser rules, but feel no antipathy towards those who don't. I can well understand why people might want to stay in an area. Why shouldn't they? Shouldn't people be free to roam the network as and when they want to? We seem wedded to the idea that it all needs to be controlled but I'm not convinced. Mooring fees are unaffordable to many people (including me), and finding a mooring seems almost impossible even if you could afford one. Usually it seems you must buy a boat you don't want with it. Why are moorings so prohibitive and restrictive? It is like street parking - once everyone gets used to the idea that you pay through the nose, we forget it doesn't have to be like that. Please remember when you lay into those who use the network in the way that suits them, that we have a housing crisis in this country and many folk are moving on to the canal because they cannot afford rent or mortgage. That crisis is not their fault. As for saying no one would set up home in the town square, have you never heard of squatting? Where people cannot get reasonably housed they do what they can toget a roof over their heads. If you look at some of the dodgy boats on the canals in London, many are not far from a form of floating homelessness. I don't think your article recognises that there are economic forces pushing people onto the canals that they do not control. Maybe you should try to explain exactly what it is that is wrong with people moving as and when they feel like it, without being monitored. And maybe also try to understand why it is that some people who would probably rather stay in one place are being forced into a roving life on the canals. @YorksDevil - thank you for your comments they are most helpful. Nice article although a little bit out of date now. Unfortunately as with other area's in life, a certain few spoil it for others. There are a few people that fall i'll or the boat breaks down, but of course these bare the brunt of the complaints. The excuses of needing to be near a school or work is a feeble attempt at an excuse, many home owners travel great distances to work or their children to school. IF they need to stay in one area , it is simple, get a permanent mooring. A lot of these boat users have cars, but of course they dont let on about that.If these boat users did the same thing with the tax man, they would probably be in jail. To claim that you are a continuous cruiser and then notmove your boat more than a few hundred metres is in theory fraud. The sooner the Canal and River Trust get this sorted out, most of us have witnessed the same boats moving back and forth, while we pay the proper fee's these people get all the benefits without paying for it. Then when CRT pay them a visit they want all the sympathy. I have no sympathy for people that deliberately make a false statement about their cruising times and laugh at not only CRT but at all the honest boaters. Currently living in USA. I'm overwhelmed at the assorted rules and regulations that must be sorted through to travel the waterways of the United Kingdom. I'm looking specifically at how viable it is for a college student to be a live aboard in the Leeds area? Trying to ascertain mooring fees, used boat prices, and the mountains of "red tape" that we just don't have in this country, is overwhelming.